Your make up that is! I have my makeup stored beside my computer… I never have to leave this desk if I don’t want. L.A.Z.Y. But… this comes at a price. My mirror is too small and a bit far away, I’m forever squinting and grabbing the mirror from one of my NARS duos or blushes instead whilst trying to apply liner or blend my eyeshadow. My bathroom has NO room for storage, so although the light is good… I’d have to drag each product in there piece by piece in the mornings. Where do you apply your makeup? i apply mine everywhere.bathroom,bedroom study table. Sitting at the computer desk with a tiny hand mirror as this is where the light is best….or standing up in my workroom to use the big mirror – the light comes from my left there though so I always think I look haggard in that one! I dream of a bathroom like that too. And a matching dressing room please! Same here, in my bedroom in front of the mirrored cupboard doors. One of my friends has a bathroom like that, the cow! Mine’s in my room, in the dark (my windows face the local fire station so I tend to shut the blinds if I’m pootling around getting ready)! I have my own makeup place in my room. I love it. the light is perfect. I use my dressing table in our bedroom! We have a tiny window infront of it though so lighting is a bit of an issue! I dream of a whole window to do my make up!! i have a full length mirror in my room with a large cabinet behind it that stores all my makeup, so i stand in front of that mirror and don the paint. it gets tiring though, sometimes. If I’m lucky, I will apply it in my room. There’s an ok mirror on the back of my wardrobe door. More often than not, I end balancing my NARS laguna open on my laptop and I do it in the living room whilst refereeing! No matter where I am, it usually involves keeping little hands off the goods. Maybe someday soon I’ll get to do my makeup without a small audience? It used to be in my bedroom, I still do my EOTD practices in there but I found that the light is more lifelike in the bathroom so that’s where I apply it. It’s a good thing that Simon is understanding and lets me take my time in there because I am in there for an AGE. i have a side table beside my bed which is against the only window i have in the room. i’ve piled some magazines on and i basically put my vanity mirror on there and just reach over to my desk for any product i may need. not an ideal set up, but i prefer doing my makeup using natural light. I do mine in the bathroom, although I wish I had the room for a nice vanity in my bedroom (and better lighting). The bathroom probably has the best lighting in the house. I’m like you at the moment- just doing it with random mirrors and with whatever I’m using in a pile on my lap. bad! I was discussing this with a friend today! I have a closet with large windows that I like to apply my makeup in because of the large mirrors that I have in that room and the amount of natural windows. However, I like to move around to my washroom and bedroom as well because of the different types of lighting, which allows me to check my makeup and make sure I don’t look like a clown. I have all my makeup stored in/on top of some Ikea Helmer cabinets that are next to my desk. I’ve been thinking about fixing up a vanity from a garage sale sometime soon because my makeup keeps creeping onto my desk space and I get distracted while trying to read for class. During the school year I do mine in the bathroom because it’s most convenient. The lighting is kind of crap (it’s all incandescent, so kind of yellow) and the only window is tiny and above the shower. I have to sit while I put on makeup (no idea why!) so I sit on the toliet, lid down of course! In the summer, I put all the products I need in a bucket and sit on my bed with the blinds open in my bedroom. It’s not the greatest, because I have to hold my mirror. There’s no room in my room for a desk or vanity because I have a shelf and a keyboard and four guitars. I wish I had a bathroom like that!~I apply my makeup in my bathroom…I have it all set up on my side of the counter…which is ok, but the sink takes up sooo much room! I long for a larger area as well! If it’s the holidays (I’m a teacher) then I apply mine in the living room; big mirror, lots of natural light. When I’m teaching, I like to minimise the “get ready” time before work (not a morning person), so I apply on the bus! I’m expert at it now. I can do a full face in less than the 17 minutes of the journey, including mascara and liquid eyeliner. I know where all the lumps and bumps in the road are by now, so that helps. People stare in fascination when I’m doing , but I don’t mind. It gave me 15 minutes extra in bed : ) Plus, I’m not the only one. There’s often at least one other woman doing the same thing and always a woman who does her hair on the journey- beautiful intricate plait. Women- brilliant at time-saving and multi-tasking! My makeup is also near my desk so I prop a mirror against the window and apply it there. My bathroom has the worst lighting ever. I’d love a makeup/dressing room! I have a vanity and makeup storage in my bedroom. I had lights installed above it so it has good light. 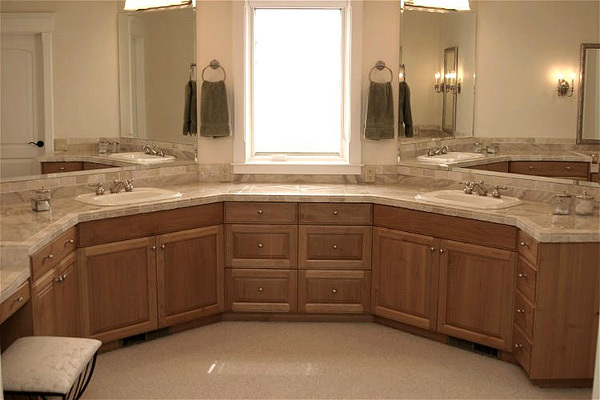 If we ever remodel our bathroom (it is huge and has good space, just crappy set up), I’ll probably move it in to there. I have a little desk in my bedroom that’s been taken over by my makeup stash. I have two sets of sterilite drawers to hold all the makeup. i’d love to have a dressing room, not a bathroom with allthis space and stations for makeup, with also a big mirror to see clothes from behind, and some settings/room arrangements to take photos with a special lamp and stuff. and this room would have a mini computer too so i can be on internet at same time. god i AM sad.